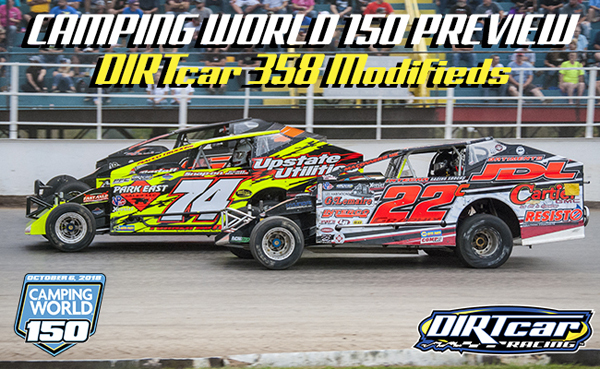 OSWEGO – The Camping World 150 on Saturday, October 6 is one of the most coveted titles in the 358 Modified ranks. $20,000 is up for grabs at NAPA Auto Parts Super DIRT Week for the first-place finishing DIRTcar 358 Modified driver. Drivers from all across the Northeast and Canada will polish their weekly racers into shape for the 150-lap feature race in hopes of capturing attention and, ultimately, the win in 2018. This year, a change in the format could shake things up a bit and broaden the playing field. Teams will not have to install quick fill fuel systems for the Camping World 150. Instead, on or around lap 100, a competition caution will be come out to give teams the opportunity to pit for fuel and tires. Drivers will not lose laps under the caution flag, but they will lose their positions to the drivers that choose to remain on the track under yellow. They will restart in the same order in which they entered the pits, but behind the gamblers that stayed on the track. Despite a potentially larger field of cars sparked by this cost-saving change, last year’s winner, Matt Sheppard, remains atop the list of contenders. Sheppard’s victory at Cornwall earlier this season is one of only two starts in the 358 Modified division. But who can count out the man who won both modified races at Oswego last year? Look for Super Matt Sheppard to be at the front by the end of 150 laps. Tim Sears Jr., the 358 Modified Southern Regional points leader and winner at Brewerton Speedway back in July, was second in 358 Modified points only to Larry Wight at Fulton Speedway this year. Expect Sears to bring it on Saturday night, as he makes his very first attempt to qualify for the Camping World 150. Machine Gun Billy Dunn is the 358 Modified Track Champion at both Utica-Rome Speedway and Can-Am Speedway in 2018, but his third-place finish in the Camping World 150 last year at Oswego makes him a worthy contender this year as well. Gypsum Racing’s Pat Ward, a.k.a. the Genoa Giant, secured a seventh-place finish at Oswego last year, a solid showing. Ward finished in third place in the Southern Region 358 Modified points with two top fives in 2018. His experience and tenacity give him a well-supported case to make a run for the 358 Modified crown at Oswego this year. Tim Fuller has had a tremendous year in his 358 Modified. Two wins for Fuller in 358 Modified tour competition this year is a statistic no other driver in the field holds. Both wins at Can-Am and Mohawk International in September prove he’s one of the biggest hot-shoes in 358 Modified competition coming to Oswego in 2018. Did we mention he’s won a whopping ten features at Mohawk this year? Case closed. Fan favorite Stewart Friesen and the Halmar Racing team will once again go for the $20,000 grand prize. Just as he quite often does at The Track of Champions, the now-NASCAR Camping World Truck Series standout found his way to Victory Lane in 358 Modified competition for the first time in many years just one week ago. Fonda Speedway has treated Friesen well over the past few seasons, and despite only mustering a ninth-place finish last year at Oswego, look for Friesen to be up front in 2018. Mat Williamson is a dangerous foe at every track his hauler pulls into, whether it’s a Big Block or 358 Modified race. The 2017 Camping World 150 runner-up will be back in 2018 with something to prove this time around. He finished second to Tim Fuller at Mohawk this season and currently sits 10th in the Northern Region points standings with only two starts. But as one of the young guns in the field, Williamson can hold his own against the best and will be poised to improve one more spot in this year’s running. Canadian Steve Bernier is eager to take on the best 358 Modified drivers in the country in 2018. A dominating season at Airborne Park Speedway in 2018 for the current Northern Region high-point man ended with an impressive six wins, culminating with a win at Autodrome Drummond in the 358 Modified tour stop last Sunday. Expect Bernier to make some noise in what will be his first start at The Steel Palace on Saturday. Tickets for the 47th annual NAPA Super DIRT Week are available online or by calling 844-DIRT-TIX. Stay tuned to the Super DIRT Week, Super DIRTcar Series and DIRTcar Racing social media channels for the latest news on NAPA Super DIRT Week.